Promoting guidance and counselling in support of the education of students. Facilitating the transition of students from primary to secondary, from secondary to post-secondary, from post-secondary educational institutions to other educational institutions and/or work. Providing curricular guidance, including subject options; choice of courses, etc. 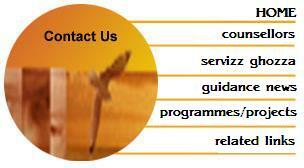 Providing personal guidance and counselling. Providing information through various activities/materials/seminars both at school and systems level, such as: Career Exhibitions, Career Orientation visits/seminars, Information leaflets etc. Keeping and updating cumulative record cards. Referring students to other services and agencies according to their needs. Promoting staff development in the fields of guidance and counselling. Participating in/or conducting research projects related to guidance, e.g. Tracer study; Espad; Health Promoting Schools Project. Facilitating parenting skills programmes and delivering talks. Organising in-service courses and professional development sessions. Organising seminars, talks and preventive programmes on guidance related topics. 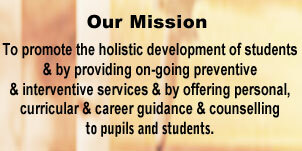 Contacting parents regarding students holistic development and other specific problem. © 2003-2004. All rights reserved. Unauthorized duplication in any form is a violation of applicable laws.